It is really strange. If I remove the NType 961 out of the outputs definition, the outputs list will work again. 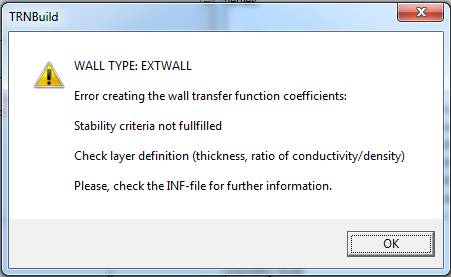 This error shows up at the first place when I give the insulation layer a big thickness. 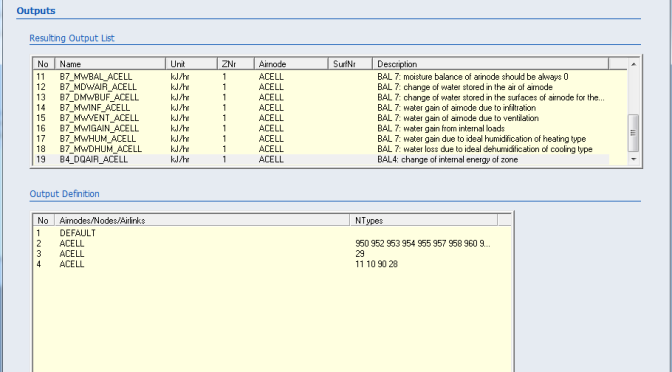 I wrote an E-Mail to transsolar support, and the trick is the Timebase setting in Output of Type 56, which is mentioned in the manual page 5-24.
more was discussed in the paper and presentation of Benoit Delcroix etc. – Sometimes the problem occurs for highly insulated walls that are not particularly thick or heavy. In that case replacing some insulation layers with mass-less layers can do the trick. Usually the thermal mass of the insulation layer can be neglected so this is my preferred approach. – Split the wall in two (or more) parts. You should split the wall as you describe (e.g. 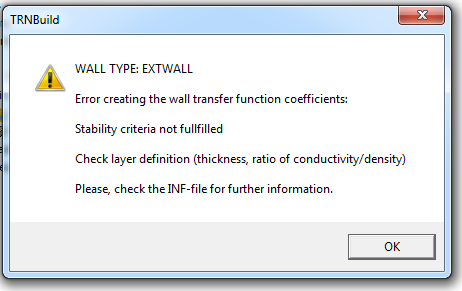 half of the thickness in each wall for a uniform wall) but then add a fictitious zone between the two parts of the wall. You basically use that fictitious zone as an infinitely small and infinitely conductive air layer. You should set a very small volume and infinite convection coefficients in the fictitious zone. I think it is best to handle windows separately from the wall if you adopt that approach (windows do not need to be part of a wall in Type56). – Increase the time base. This is obviously not a great idea if you also have much lighter walls in the building, but if you are simulating a castle with 3-m thick walls all over I guess that would be acceptable. In any case I would setup a test model with standard walls that are OK, apply the workaround (e.g. add the fictitious zone) and check that the results are the same. Then you can replace the walls with the one that causes the problem. *********************************************************** * TRNsIDF.EXE - translater from IDF created by Trnsys3d to B17 *********************************************************** This program sorts and renumbers the IDF file and writes a B17 file based on the geomtric information of the IDF file and the template B17 file. In addition, an template DCK file can be generated. CALL: TRNSIDF.EXE %1 %2 %3 %4 %5 %1 absolute path\filename.idf %2 absoluter path\NewFileTemplate.d17 %3 /dck create a template DCK %4 /nonum (optional: no renumeration of surfaces) %5 /N (optional: BatchJob Modus) Note: if no path is defined, the directory of TRNSIDF.EXE is assumed. the template B17 file. In addition, an template DCK file can be generated. Note: if no path is defined, the directory of TRNSIDF.EXE is assumed.